While searching for answers, donning disguises, and sneaking around where no proper ladies would ever go, they pair with Jasper Forth, a police constable, and Ray DeLuca, a reporter in whom Jem takes a more than professional interest. Merinda could well be Toronto's premiere consulting detective, and Jem may just find a way to put her bachelor girlhood behind her forever—if they can stay alive long enough to do so. "The author describes the 1910 Toronto setting incredibly well, immersing the reader from the beginning. Jem and Merinda are perfect foils for each other; levelheaded Jem, balances impetuous Merinda. With shades of Sherlock Holmes, tongue-in-cheek footnotes and a great whodunit, put this one on your must-buy list." "Playful characters (and wry footnotes that break the fourth wall) delightfully contrast the suppressive Victorian setting, while a bit of danger raises the ante. McMillan has created two equally likable and unique heroines. Good fun." "Merinda and Jem are certainly swimming against the tide of Edwardian ideas of how women should behave. The author does a great job describing the time period, and creating for the reader the "feel" of what it was like to live then. The mystery was good, and I liked that there wasn't anything offensive in it.... I suggest this 4-star book to mystery readers, especially those who enjoy period settings." "Not only is the story an intense mystery at times, but the clearly well-researched historical elements combine to form a unique narrative. Normally, a book is either a riveting mystery OR an endearing historical. This story achieves both! With heroines who clearly allude to Sherlock Holmes characteristics, female readers will delight in discovering each of the many references sprinkled throughout the novel. Without question, I will look forward to the next installment of the Herringford and Watts Mysteries, and if you give The Bachelor Girl's Guide to Murder a try, I'm pretty sure you will too! "I really enjoyed this amusing mystery about a couple of bachelor girls solving crimes! This was a unique story done in a unique way. I read a lot and this was a little bit different than anything I've read before, which was a good thing! I always like discovering a fresh angle. I loved the tongue-in-cheek humor and the sweet romance.... I can't wait for the next one! I highly recommend this book!" "Rachel McMillan did a great job of developing the characters and the setting, and I'm eager to see what Jem and Merinda are up to in the next installment in the series. For such a short book, the story was fantastically engaging and just downright fun, and I'd encourage historical and mystery fans alike to give it a shot." Fun, fanciful, mysterious - the perfect read for fans of Sherlock Holmes. I enjoyed this jaunt through the streets of Toronto on the heels of mystery and discovery inspired by Sherlock Holmes. I’ve long been a fan of Holmes and enjoyed this nod to his mysteries and detective acumen. I found Jem to be an adorable character who’s growth through the book was enjoyable to watch. Merinda was slightly more difficult to love, as in the way of Sherlock. She had her lovable moments, but there were times when she was slightly oblivious in a way that made me a bit mad at her. Then again, that could have been the point. The only thing that I didn’t enjoy was the point of view changes. I’m a stickler when it comes to POV (must be a personal thing) but I love to be “in” someone’s head and know that’s where I rest. I feel as if I can truly get to know a character that way. That was not the case for this story and, often times when it switched POV in the middle of a scene, I wondered how we knew what we did. This always jerks me out of the story and was the case in this book. I’m sure there was a stylistic reason for it; I just don’t personally enjoy it. I did however enjoy the asides by way of footnote – they were fun! I would recommend this to fans of Sherlock Holmes, historical fiction, and lovers of fun and lighthearted mysteries. "With the witty wordplay and inventive plot twists of a classic Sherlock Holmes mystery, McMillan spins a detective tale sure to delight and fascinate those who love entertaining novels full of clues and sleuths and lively characters that live long after the story ends." "In her fabulous debut, Rachel McMillan brings 1910 Toronto to rich and wonderful life. The intrepid Jem and Merinda make a winning detective team. Full of romance and derring-do, The Bachelor Girl's Guide to Murder will keep you turning pages." "Smart, sassy, and chic. The Bachelor Girl's Guide to Murder is all that and more. A fabulous historical. Encore, Rachel McMillan!" "A wonderful romp! McMillan's delightful debut introduces us to a beguiling and intrepid crime-solving duo. The two lovely ladies defy expectations and social norms as they lead us across early twentieth-century Toronto and into the heart of a compelling mystery...with a dash of romance on the side. Can't wait for more of these two and the adventure they'll lead us on next!" "A savvy and street-smart read. Rachel McMillan's The Bachelor Girl's Guide to Murder is a wickedly clever debut, with the wit and intelligence of a classic Agatha Christie whodunit. It's a vintage-inspired ride with a dash of mystery, romance, and just enough suspense to keep the reader guessing. I was drawn in and held captive with the turn of each page!" "One does not merely read The Bachelor Girl's Guide to Murder. Rather, one enters the story, allows the author to take her on a wild ride through early twentieth century Toronto, and remains unable to do anything but turn the pages until the final scene has ended. McMillan has created characters whose exploits will live on well beyond this story. Well done! Now hurry and write the next one!" "In her stunning debut, Rachel McMillan achieves a perfect balance of wit and warmth and invites readers into an entirely new world. 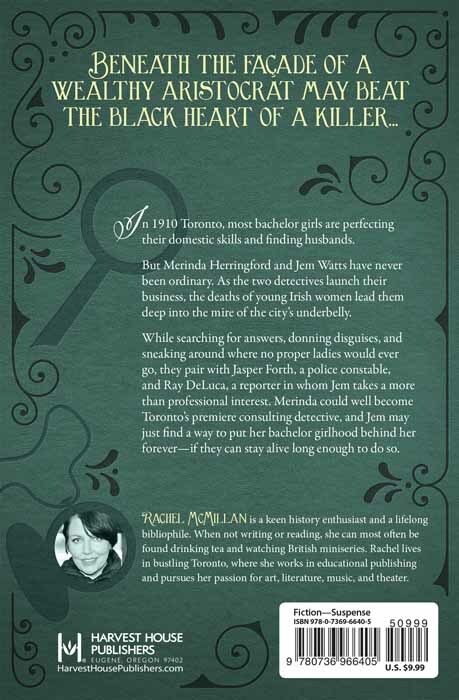 More than intrepid detectives, Bachelor Girls Jem and Merinda are fully fleshed women, grappling with mysteries of the heart as well as those of the gritty streets of historic Toronto. A cast of supporting characters brings life and dimension, as well as the promise of more stories to come. McMillan's homage to the spirit of Sherlock and Watson stands solid on its own, whether in pick heels or brogans." "Come for the gorgeous cover and promise of mystery; stay for the lilting romance and tingling wit. Rachel McMillan's debut is the perfect mix of engaging characters and a fresh, enticing voice. Simply put, I'm hooked!" "There's nothing more delicious than discovering an author whose novel is as fabulous as the cover art suggests. Debut author Rachel McMillan is a refreshing new talent in the inspirational market, penning an enchanting tale of murder, mayhem, and Sherlockesque shenanigans. Jem and Merinda will captivate readers' hearts as their adventurous spirits cause them to buck social norms for ladies of their day, resulting in humorous and dangerous consequences in equal measure. Toss in a charming Italian journalist with a penchant for verse and a dedicated member of the Canadian constabulary with a weakness for a certain woman, and sparks...and bullets...are bound to fly. Unique, witty, and invigorating, McMillan's prose is smooth, her historical detail excellent, and her bachelor girls appealing in every way. Sherlock Holmes and Phryne Fisher may need to step aside as Herringford & Watts, Lady Detectives, are on the case!" 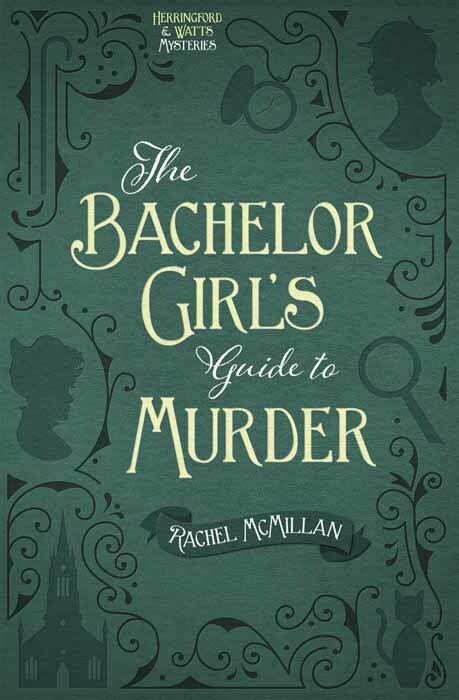 "Possessing light-hearted, witty humor, and clever Sherlockian style sleuthing — The Bachelor Girl's Guide to Murder by Rachel McMillan is a FUN and entertaining read!"